Mixing up “moody” slime. Creating color-changing “worms.” Making a mess. Having fun. These are just some of the ways that students learned about complex scientific principles such as thermochromism (the property of substances to change color due to a change in temperature) on the day we visited the Science Explorers after-school club at Marlborough Elementary. Science Explorers is led by fifth grade teacher Mrs. Toni Arner (who, like all Science Explorers participants, goes by her chosen alliterative science name, Tornado Toni) and kindergarten teacher Mrs. Sara Barnoski (aka Sunny Sara). 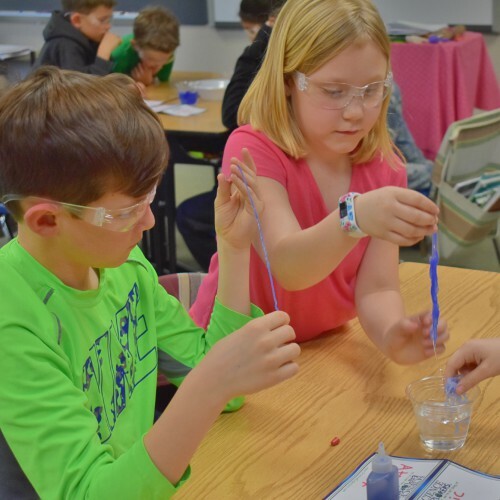 The club features innovative, hands-on experiments and activities for elementary students. 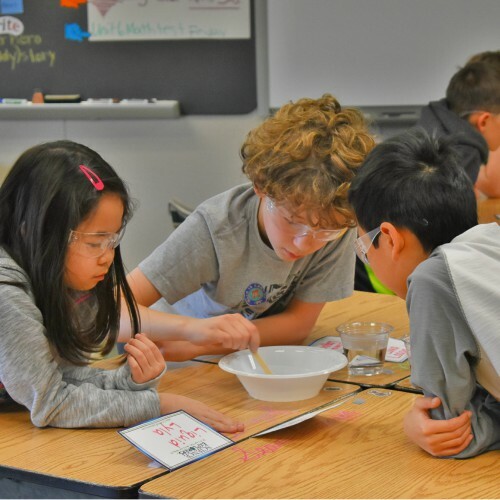 Every Wednesday afternoon, approximately 24 students rush to Mrs. Arner’s classroom shortly after dismissal, and for an hour, they learn about science in an entertaining and engaging way. On the day we visited, the session started with a brief, age-appropriate lesson on thermochromism. The group was quickly informed about their first activity, donned protective goggles and got to work making jelly-like “worms” that changed color in warm and cold water. After packing their worms in plastic bags to take home and experiment further, the explorers moved on to the second activity of the afternoon: mixing up a batch of color-changing slime. It was a surprise for those who chose red as their initial color, that their slime turned to a deep purple when exposed to ice. The students who chose yellow were equally shocked by the dark blue color change of their cold slime. Students also got to take home their slime to show off to their families. 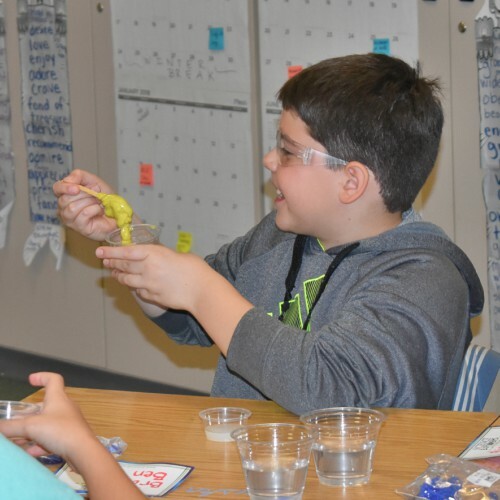 Other activities the Science Explorers have tackled include learning about: chemical reactions by making ooblek, surface tension by examining layers of bubbles, oxidation by cleaning pennies with taco sauce and chromatography by taking apart colors. Each week there is a take-home component, which allows students to continue learning, and provides them with fun beyond the classroom. Science Explorers is so popular that there is regularly a waiting list for participation. Hereford Elementary also offers a Science Explorers club for interested students. Science Explorers is an innovative, hands-on science company dedicated to providing an opportunity for children ages 4-11 to become engaged in the wonders of science. Whether it’s an after-school program, science summer camp, school assembly or scout badge earning event, Science Explorers can make science cool and exciting through an interactive, hands-on format. Science Explorers was founded in 1999 by Jennifer Moorehead with a mission to make science fun. Since then the organization has brought exciting, inquiry based hands-on science programs to thousands of elementary aged children throughout Pennsylvania, New Jersey and Delaware.